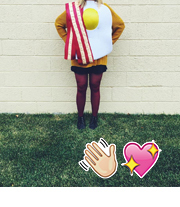 What do you make a burger-loving lady for her birthday? 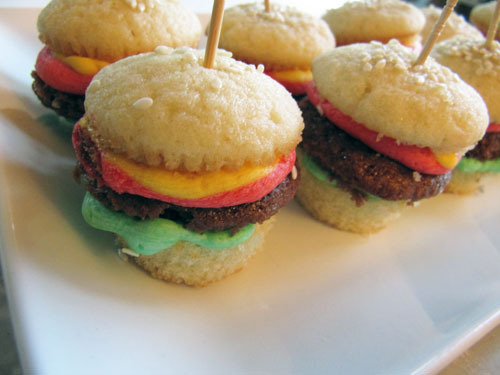 Hamburger Mini Cupcakes, of course! Isn’t it kinda crazy how the chocolate cupcake part really looks like a burger? Is it weird that after I made these I kinda wanted a real burger? Mostly though, these guys are tasty pranksters. P.S. I’m really loving having big windows now, but the truth is I’m still figuring out the lighting situation. I made these after work Wednesday, and it’s just getting dark sooner and sooner. So that, my friends, is why I don’t have that many pictures. But these were just too fun not to share. Let me know if you have any questions. Cheers to burgers! * Recipes for cupcakes and frosting are below. Slice the vanilla cupcakes in half, separating the muffin-top from the base. Set aside. 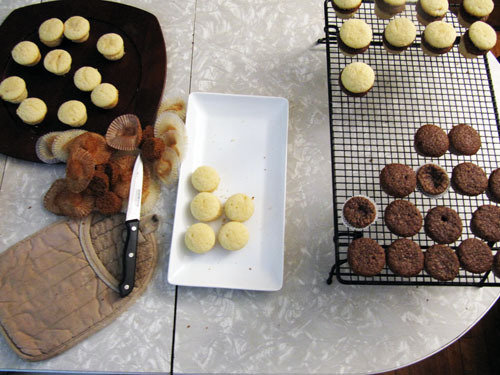 Slice the muffin-tops off of the chocolate cupcakes and set aside, disposing of the bottoms (into your mouth). Pipe green frosting onto the bottom layer in a squiggly line to resemble lettuce (like below). Place the chocolate muffin-top, burger, on top of the green frosted lettuce. Pipe the ketchup in a circle over the chocolate burger. Top with squiggly yellow frosting mustard. Place the top bun on the condiments and press slightly. Brush a very thin layer of water on top bun (or use your finger dipped in water). Sprinkle with sesame seeds and pierce with a toothpick. Refrigerate until time to eat. Preheat the oven to 350°F. Line 24 mini muffin cups with paper liners. Whisk together the flour, baking powder, baking soda and salt in a medium bowl. Combine the milk, oil and vanilla in a 2-cup measuring cup or small bowl. In another medium bowl, with an electric mixer on medium speed, beat the butter and sugar until light and fluffy, about 3 minutes. Add the egg and egg white, one at a time, beating well after each addition. Reduce the speed to low and add the flour mixture alternately with the milk mixture in batches, beginning and ending with the flour mixture and beating just until blended. Divide the batter between the 24 paper lined mini muffin cups. 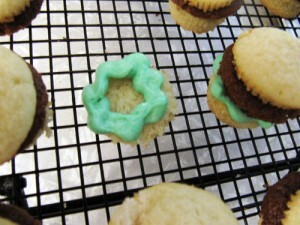 Bake for 10 minutes, or until a toothpick inserted in the center of the cupcakes comes out clean. Set aside to cool on a wire rack before assembling the burgers. Preheat the oven 325ºF. Line 24 mini muffin cups with paper liners. Divide batter between 24 mini paper lined muffin cups. 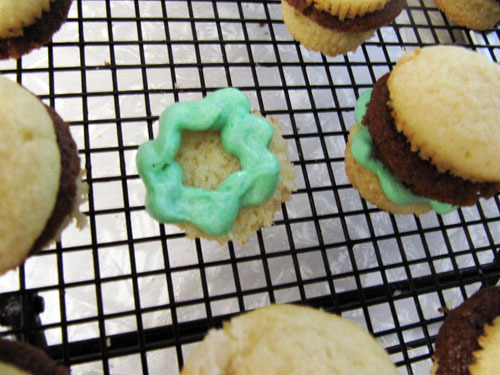 Bake in the preheated oven for 10-13 minutes, or until cake bounces back when touched and a cake tester or toothpick comes out clean when inserted into the center of a cupcake. Let the cupcakes cool slightly in the pan before turning out onto a wire rack to cool completely. Mix butter and powdered sugar until combined with an electric mixer. Add vanilla and milk 1 Tablespoon at a time until a thick consistency. Divide frosting into three bowls, dying one red, one yellow and one green. Divide colors into plastic sandwich bags, snipping off a corner for easy piping. Megan, you amaze me often. These are really exceptional. I am sure they taste as good as they look. Great job. Megan! Yum! I wish I had an excuse (and time) to make these!!! Oh, Katy, you totally should make them. They are prettttty fun. I had a burger for supper.. Dad MADE me go for a ride on the cycle to get supper.. it is to chilly. Those would be the cutest birthday present to receive! Your creativity never ceases to surprise me Megan. Absolutely adorable! 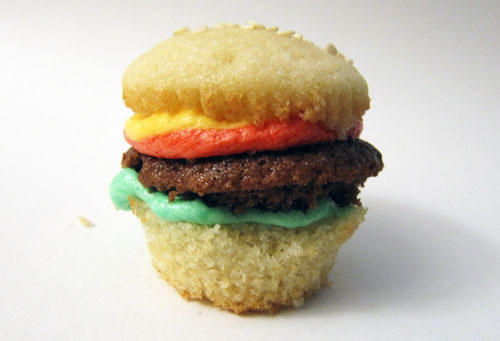 My dream is to have a meal that consists of a great homecooked burger and then one of these cupcakes! Thanks Beckie! 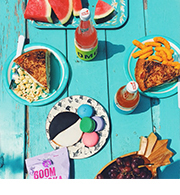 That’d be so fun to have burgers for dinner AND dessert. You can even make shortbread cookie french fries! Those are really cute and it looks delicious too. I should try to make these cute mini burgers of yours. You seem to be a creative baker with all that you have done there. Thanks for sharing this one. Thanks Rose! You should totally make them. They’re super fun. My kids will surely enjoy making this one. I think we should make your recipe this Saturday. This will be a fun and exciting baking activity. Yummy activity too. Thanks for sharing. You are truly an expert.